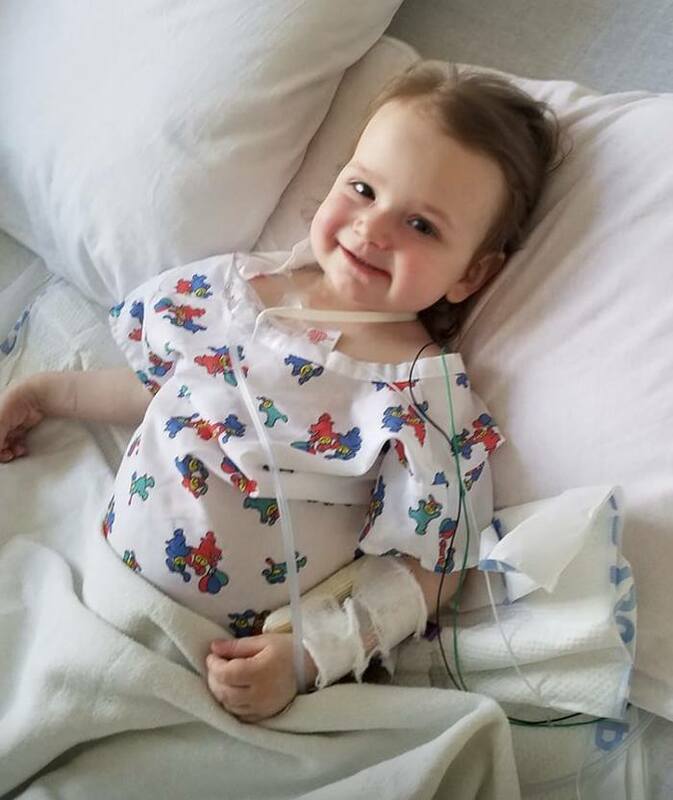 Lily Malinowsky was an energetic 1 year old, when last September she started having unexplained fevers and rashes, and was ultimately diagnosed with Systemic Juvenile Idiopathic Arthritis (or SJIA). She was started on Canakinumab (Ilaris) soon after diagnosis. In November 2018, her Ferritin levels started climbing and reached 7,000. Lily was admitted to the hospital for MAS, treated with pulse steroids, and was shifted from Ilaris to Anakinra (Kineret). In the beginning of February 2019, she was admitted to the hospital for difficulty breathing, and a high heart rate. She was started on oxygen. A CT scan showed Interstitial Lung Disease (or ILD), which is being recognized more often in children with SJIA. Doctors felt that Lily’s ILD was advanced and started her on Mycophenolate Mofetil (or Cellcept) immediately, and also gave a first dose of Cyclophosphamide. Later doctors confirmed the presence of Pulmonary Alveolar Proteinosis (or PAP), another lung disease that is being recognized in SJIA more often. While in the hospital for ILD, Lily went into MAS – her Ferritin rose to 26,000. She was transferred to the ICU and started on IV steroid pulses. Her Ferritin kept climbing, going upto 80,000. Her oxygen needs also increased going upto 7 liters. In the ICU, her doctors started trying all sorts of interventions including plasma exchange. But nothing seemed to be working. After consulting with SJIA experts from Cincinnati Children’s, her doctors decided to try Gamifant (interferon gamma (IFNγ) blocking antibody), a drug that has recently been approved for HLH. As the drug is not available to prescribe yet, her doctor requested the company for compassionate use, which was approved within a day. Lily was given the first dose of Gamifant on Feb 27th, 2019. By the next day, her Ferritin had gone down to 27,000. By March 1st, her Ferritin levels were down to 19,000. Over the course of the month, Ferritin went slowly down, and is now in the 600’s. Her oxygen needs went down as well – she is currently on 1 liter of oxygen. On March 29th, after 50 days of being in the hospital, Lily was finally able to go home. She still goes to the hospital twice a week to receive Gamifant infusions and remains on many medications, but she is doing much better. Her parents are thrilled she is recovering well. We are thankful to her parents for sharing her story. To the best of our knowledge, Lily is the first known case of an episode of MAS being treated with Gamifant in the USA. Also, a clinical trial for Gamifant in MAS was just approved. This means that Gamifant is now an option for patients with MAS, who do not respond to conventional therapy. MAS is a life-threatening complication of SJIA, and we are excited that there is a promising new drug under clinical trials.